She always looks directly at the camera, I wonder what she is thinking. Awww. What a cute picture. Beautiful picture and little girl! 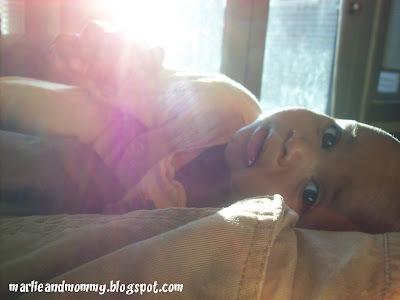 I absolutely love sunbeams around babies...it makes them look angelic. She's adorable! I love the way you captured the sunlight coming in. Cool photo! Marlie is cute, as always, but the sunbeams are also very interesting and artsy! She is such a little beauty, just like her mama! I know I have been really slack lately with my visits but it is definitely not because I haven't wanted to! Thank you SO very much for your sweet, sweet words each time you come to visit me. I really appreciate them more than you will ever know. Kind, genuine encouragement like yours is such a blessing to my spirit right now. It truly helps keep me going. Thanks for being my awesome friend! *thanks a ton for the support. Awww A doll! I love your adorable Marlie!